Beijing is a city with more inhabitants than all of Canada. Unless you do a lot of site seeing you are unlikely to visit most of it. Cabs are cheap by Western standards and the subway system reaches most of your desired destinations. Wu Dao Kou is probably where you will spend most of your time; however Chaoyang is a very important business district. Chaoyang District is where most of the embassies located. And it is also the center of foreign owned companies. So many networking parties take place in this area. This is the neighborhood right outside the main gate of Tsinghua. A lot of foreigners live in this neighborhood especially the large housing complex called (Hua Qing Jia Yuan 华清家园) which is located here. As a result you can find menus in English and order in English at places such as Lush. This neighborhood also has a variety of restaurants including familiar names such as Pizza Hut, KFC, and McDonalds. Although the name may be the same, the menu is likely slightly different than you remember from back home. Although Danna is not a fan of this place as it can be smoky. It is a very popular hangout for Westerners in Wu Dao Kuo. It has quite a few features that make it appealing. First of all it has an English menu, serving Western food, and the wait staff understands simple English. Secondly it has its own wireless network which you can use to surf the net including sites outside of China. Lastly it has a large number of imported beers including some excellent Belgian beers including Duval, Leffe, and Hoegarden. There are probably cheaper places to eat or drink but the prices are not exorbitant. Although a world capital and massively large, Beijing and China in general is not a good source of English language reading material. The government keeps most periodicals out of the country and the books available tend to be either on China or classics. 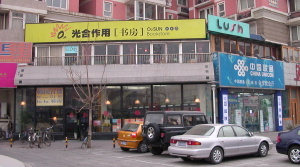 O2 Sun Bookstore is not an exception, its claim to fame lies in its large selection of Chinese language study books including the one needed for Basic Chinese at Tsinghua. 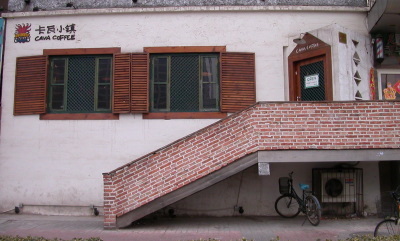 This bookstore also contains the Reading Café which is one of Danna's favorite two cafes in Wu Dao Kou. Although just a convenience store it has a wide selection of imported Western beers and several flavours of Snapple. Having lived abroad several times including once before in Asia let me assure you, it is not easy to find Snapple or Old Speckled Hen. They also sell a lot of familiar Western brand named products and have a selection of cheeses too. Nearby My Shop is a Ramen shop which besides excellent noodle soup they also do a mean fried rice. This is Japanese style Chinese food. The owner is Japanese so it tastes a lot like it would back in Japan. Upstairs is a popular Japanese restaurant that serves sushi of course if that is more your style. There are many places to check the internet including several open WiFi spots in Wu Dao Kou. I had the most luck early on at this bakery. It only has two computer terminals and I do not think its WiFi spot is that widely known. Consequently I’ve never seen anyone else use it besides me. I had a lot of trouble checking my email when I first arrived in China, although slow Tour les jours WiFi spot consistently let me download my mail. This is a Korean chain. 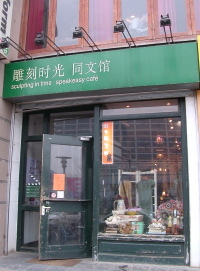 This is a popular café with both expats and Chinese locals. In addition to coffee and tea it has pizza, pasta, and sandwiches as well as cakes and cookies. It isn’t very loud and is a popular place to study or surf the net on their wireless network. I had less success downloading my mail here. Do not expect really fast internet connection speeds in China when surfing websites outside the country. Sculpting in time cafe is much more popular which may further decrease the speed you can surf the internet at least that has been my experience. There are a number of bakeries in Wu Dao Kou, by far our favourite is Madeleine. They sell all manner of cakes and treats. 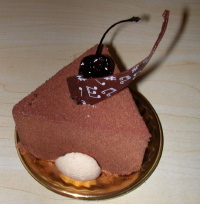 You can get a one person sized dessert for 15 RMB or 12 RMB later at night after 8pm. Some days they even offer baked goods at 50% off in the evenings. This is a Korean run business, one of many in Wu Dao Kou. This is another café in Wu Dao Kou which has an English menu and WiFi access. It serves Thai food as well as Western food. It is open quite late and is much quieter than Lush or Sculpting In Time especially in the evening. It has an excellent selection of teas, coffees, and imported beers. It may be your best bet if you really do want to do some studying. This is a Japanese restaurant behind the building with KFC, Pizza Hut, and Tous les jours in it. Although the location is a bit hard to find, it hasn’t affected its popularity. Although the ramen isn’t as good as the Ramen Shop, it serves a wide variety of Japanese food including numerous sushies. It is considered by many to be the best Japanese food in Wu Dao Kou. Of course there is a Starbucks in Wu Dao Kou. It is right by the East Gate of Tsinghua. It is likely not open early enough for you to pick up a latte or cafe mocha to go before your first class. Assuming your first class is 8 am. It is also not open as late as some of the other cafes in Wu Dao Kou. It has WiFi and I suspect they get their internet access from someone diffierent than the other cafes as often when the internet is out at other places it still works at Starbucks. Starbucks clientel contains more professionals who work in the Tsinghua Science Park. Onward to Section 4: Tsinghua or return to the introduction.